If you have ever been to some islands in this country then you probably know this scenario: You just took a ferry for an hour or two, checked in at your hotel and the first thing you do is to take a look at the beach. Then it often turns out that the nicest beach on that particular island is just fine but nothing like you have seen in the tour guides or websites or google image search. The reason for that is that you need to do another day trip on the speedboat to some of the smaller, remote islands to see the real gorgeous beaches. 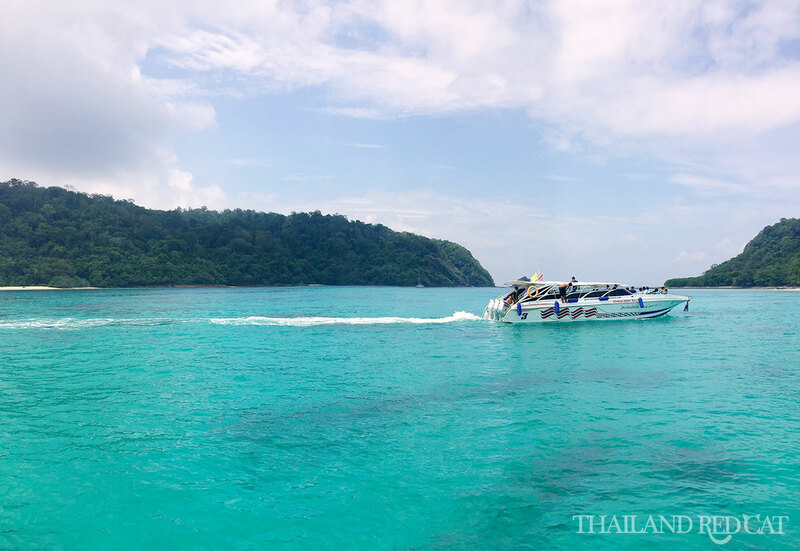 There are many examples for this: On Koh Samui you would go on a trip to Ang Thong Marine Park or on Koh Chang you would take the boat to Koh Mak or Koh Kood. So yes, that’s right: You visit one island only to find that the best beaches in the region aren’t actually where you are staying. It’s the same on Koh Lanta. The beaches are alright but it’s nothing compared to Koh Rok, which are two tiny islands about one hour by speed boat from Koh Lanta away. So a stay in Koh Lanta is all about exploring the different viewpoints by motorcycle, chill out at the many scenic beach bars and maybe do some kayak trip or visit the old town. I have covered that already in the Lanta Daytime Guide. Koh Rok is by far the most beautiful and least visited island of all three tours. 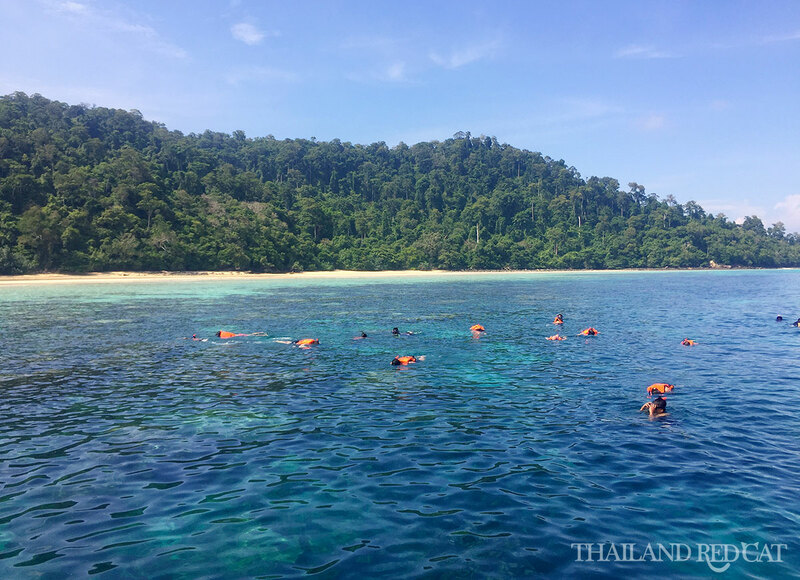 The 4 islands tour might be fun, too, but if your priority is on the beach itself and snorkeling then you should go for Koh Rok. 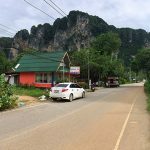 And well, Koh Phi Phi is another must visit, but I’d recommend you to do this trip from Ao Nang instead – the tour price is cheaper and the distance is also shorter. When I visited Koh Lanta last month, I booked my Koh Rok trip right at my hotel (Keereelay Resort, really nice place up on the hill with awesome value for money) and it cost me 1,300 Baht. It was the low season (October) so they gave me the discount from the standard price which apparently is 1,700 Baht (at least that’s what it says in the tour brochure above). The tour price includes pick up from your hotel, the speed boat cruise, snorkeling gear, buffet lunch on the island, water, fruit and transfer back to your hotel. That’s a fantastic deal if you ask me and even if it cost 2,000 Baht I think it’s still worth it. At 9:30am we were introduced to our Thai tour guides (good English skills) and entered the speed boat that had space for 30 people. We left Koh Lanta and cruised (or rather raced?) directly towards Koh Rok about 50km down south. After almost exactly 1 hour we reached the small sister islands named Koh Rok Yai and Koh Rok Noi (yai means big and noi means small). The boat stopped just about 50 meters off the shore and our guide gave us the snorkeling equipment and announced that we had 1 hour to spend there. There was some nice fish, but to be honest the second snorkeling spot in the afternoon was much nicer – see below. We all left the boat and walked towards the visitor area just behind the beach where they had already prepared our buffet lunch under the trees. And I continued walking down the beach until I found my little paradise. At that point I couldn’t resist any longer so I stopped taking photos, took off my shirt and jumped into the crystal clear water. Fantastic experience and I was surprised how few people walked away from the main visitor center to swim in this much more relaxed part of the beach. And believe it or not, I even saw a sea star in that water (I almost stepped on it!). Like you can see, it’s not that bad. 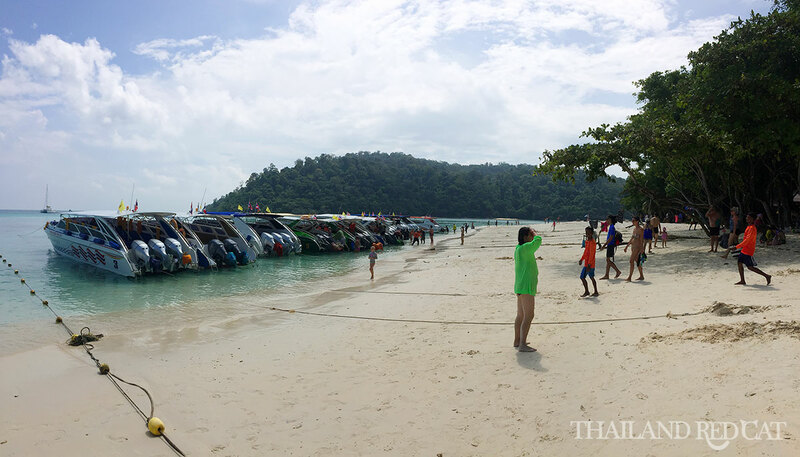 There are far less speed boats arriving at the beach on Koh Rok compared to the likes of Maya Bay on Koh Phi Phi or in the Similan Islands. However, I was told that they have just recently started to promote Koh Rok to keep up with the increasing number of tourists so make sure you visit there before its natural beauty gets somewhat spoilt. No, I really couldn’t complain. At about 2pm it was time to get on the boat again. Don’t think that’s a lot of boats until you’ve been to Maya Bay. Most people took out their snorkeling gear again, but there were also a few guys who were too tired or just too lazy to jump in the water again. I did go for the second snorkeling session though, and it turned out to be a great decision. There were incredibly many colorful fish, lots of impressive reefs and I even discovered three “Nemo” fishes! Make sure to check out my short video below, I’ve got it all recorded. After 40 minutes we left Koh Rok and cruised back to Koh Lanta, where we reached the jetty at around 4pm. The pickups already awaited our arrival and at 4:30pm everyone was back in their hotel. One of the best day trips I have ever done in Thailand. I actually wished I had planned my schedule more flexible and had more time, because then I would have stayed one night on Koh Rok. 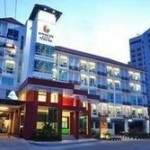 Yes, they have tents available for 500 Baht a night. 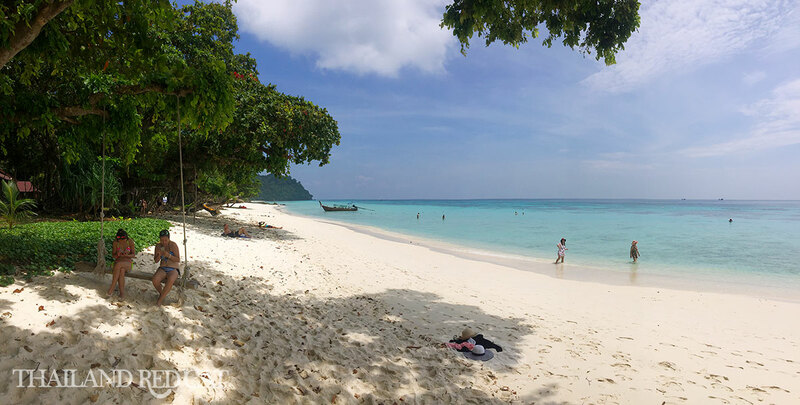 Must be an amazing experience to chill on that gorgeous beach in the late afternoon until sunset, drink cool Singha beers and get a little nostalgic on what a wonderful country you’re living in. Well, surely I’m doing that every once in a while but next time I’m going there I will make sure to spend a night there. 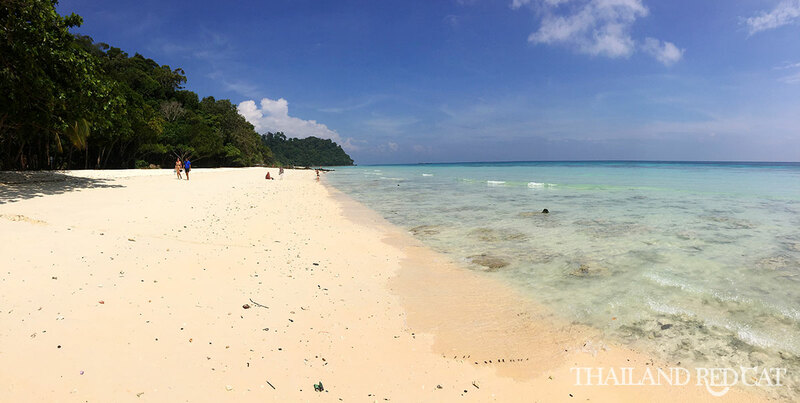 But even if you don’t – it’s well worth it and not (yet) as overrun as many other islands in Thailand. is there any nightlife spots in koh rok? No. This is a tiny island and all they have there is a camping site and very basic facilities like public bathrooms and a kitchen. Sure, if you spend the night there in a tent you can buy a beer, but don’t expect any girly bars.